Rosacea is one of those skin ailments that never really goes away. Living with Rosacea is difficult, and can have a negative impact on self-esteem. You don’t “grow out of it”, and there isn’t a cure. But there are ways to manage it, are you helping or hurting your skin? There are many different kinds of Rosacea. The most common presents itself as red, dry cheeks. Unfortunately, most women just try to moisturize, moisturize, moisturize. Here’s the issue, moisturized corn flakes eventually dry out and look like corn flakes again. So if your skin is as dry as corn flakes, what do you think it’s going to look like once the moisturizer dries? Now you’re starting to get the idea. Start out with a cleanser that’s gentle enough for Rosacea. But you might not need this all over your face. If you have combination skin (for example, Rosacea on your cheeks and acne on your forehead), you’ll want to try targeted cleansing with a washcloth. This is because something that is nourishing enough for Rosacea might actually aggravate acne, and the other way around. Light exfoliation: even if you get inflamed temporarily, you need to get the dried out corn flakes off your skin. 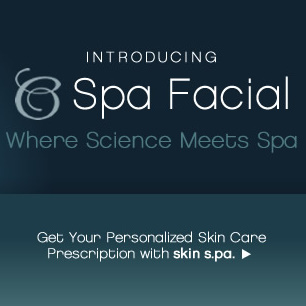 It’s probably best to begin with physical exfoliation. Once you start using a chemical exfoliation, you’ll want to leaved it on for only a few minutes. There are also daily exfoliators like BC Spa Resurface Daily Resurfacing Serum, the fruit enzymes will help get rid of the dryness on a daily basis. Don’t use a regular toner! Most over-the-counter toners (even the “sensitive” ones) contain alcohol which will exacerbate Rosacea. Use a nourishing toner that’s alcohol free, like BC’s Rinse and Restore Tonic made especially for Rosacea, Eczema and KP. Use an alcohol free moisturizer. I know it sounds obvious, but you’d be surprised how many moisturizers on the market are diluted with alcohol (to make it look like you’re getting more for your money). Just like the cleanser, you might need a different moisturizer for the Rosacea and the rest of your face. You’ll have to test this on your own skin, everyone’s skin is different. If your Rosacea is not just dry, red and itchy, you’ll want to be more careful when performing these steps, use a little common sense. For example, if your skin is cracked, start with just a light physical exfoliation a couple of times a week. You will only want to start chemical exfoliation AFTER the cracks have healed. One of the things you should NOT do is treat the pimples associated with Rosacea with acne medication. The acne that sometimes occurs at the same time as Rosacea is usually caused by the inability of the pores to breathe through the dry skin. This will get better with exfoliation. Acne products are drying and will only make your Rosacea worse. So, if you think that moisturizing alone will help get rid of Rosacea, remember…Say Goodbye to the Corn Flakes!